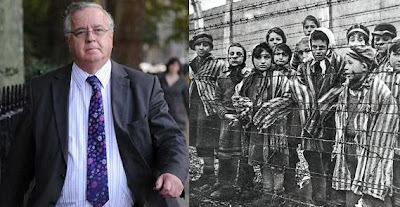 Don’t Call Me Dave was not planning on writing a blog today, but feels compelled to put digit to keyboard after reading in the Daily Telegraph that disgraced Conservative MP David Wilshire has compared the public treatment of MPs to the plight of Jews under the Nazis. Wilshire was heavily criticised for paying £100,000 in expenses to a company he owned with his partner. Consequently he “decided” to stand down at the next election. However, in response to a letter sent to his constituents (at taxpayers’ expense of course) one resident, Mr Christopher Frazer - who stood as a Conservative candidate in 1992 - wrote to Mr Wilshire suggesting that he stand down immediately. The public are entitled to be angry at the rampant troughism of MPs, but to suggest that our anger is even remotely comparable to the Nazi atrocities where six million Jews were brutally murdered proves that people like David Wilshire are totally detached from reality. His deluded sense of entitlement makes DCMD nauseous. Whilst many people will be glad that he is stepping down, it is regrettable that our system of government does not allow voters the opportunity to properly express their dissatisfaction by throwing this greedy self serving parasite out of office immediately. 11:00 PM UPDATE: The Daily Telegraph now reports that David Wilshire has apologised for his revolting comments, having been ordered to do so by David Cameron. However, a forced apology is frankly not worth the paper it is written on. The Telegraph has further revealed that Mr Wilshire also compared the plight of MPs to black Americans murdered by the Klu Klux Klan. As Conservative candidate Louise Bagshawe said: “David Wilshire's remarks are grossly offensive. We're well shot of him.” Quite. Maybe when Mr Wilshere is no longer an MP he can sit and read some books and research on the Holocaust before he makes such statements again!